Remind me never again to travel on a Sunday. Needing to get back for some important meetings tomorrow I set out from Cardiff this lunchtime leaving plenty of time for the journey. Just as well. For a start, First Great Western trains were disrupted by “planned engineering work”. Not very well planned, obviously. The train I got on was to be diverted via Bath Spa, adding about an hour to the usual journey time. But that wasn’t the main cause of vexation. When it arrived at a crowded platform at Cardiff Central, the 12.53 consisted of just seven coaches, three of which were First Class. To add to the chaos and consternation, Coach B, in which several people standing beside me had reserved seats, did not exist. Not having a reservation in a real or imaginary coach, rather than stand for 3 hours I went and sat in any empty First Class carriage and when the guard arrived I paid the £15 upgrade to Weekend First, congratulating First Great Western on a cleverly-worked scam. Deliberately running a short train on a busy route to increase revenue this way is cynical and exploitative but that’s what it means to run a train company these days. Anyway, the weather being quite nice when I arrived in Paddington I walked through Kensington Gardens and along the Serpentine before heading down to Victoria. Stage two of my journey via Southern Railways turned out to be no better. More “planned engineering works” meant all Victoria to Brighton trains were diverted through Littlehampton. A replacement bus from Three Bridges was offered as an alternative “possibly a little quicker” but having no confidence at all that a bus would actually materialise I stayed on the train as it trundled through rural Sussex. I got to Brighton Station around 7pm, about 6 hours after leaving Cardiff Central, but at least I got a bus straight away. I hope the rest of the week isn’t as exasperating as today, but something tells me that it might be..
Well then. Back to Blighty. Not the best journey home, though. For a start, the 11-hour flight from Cape Town became a 12-hour flight because of an hour spent circling around in a holding pattern over South London. One expects that at Heathrow. Air traffic delays are the rule rather than the exception, and you learn to get used to it. Kind of. Although since it always happens you would think the airlines might include it in their timetables and other advertising, for the sake of honest and accuracy. Just saying. Nevertheless, this didn’t particularly annoy me. Despite getting no more than an hour’s sleep last night I was in a fairly good mood when I got off the plane. At least until I got into the terminal building, Terminal 5 at Heathrow. For those of you not familiar with this terminal, it’s a gleaming and apparently spacious affair only a few years old. The problem is that when it gets busy, like this morning, you discover that this glitzy exterior masks a design that’s completely idiotic. All this for a journey of about 2 minutes. It would have been much simpler to have constructed a walkway to the main terminal. In fact there is one. For staff only. But not for the passengers. There had to be a transit. Transits are the thing. Of course having a transit means having an extra subterranean level to the building, with lifts going down to it at one end and up from it at another. But lifts are the thing also. There are lots of lifts at Terminal 5. Going forward we’ll all be going up and down. I wonder if the architect had shares in a company that makes lifts and transit trains? Anyway on arrival at Terminal 5 there was a similar scrum at the lifts up to passport control. No escalators were working, so I had to wait in the crowd of disgruntled passengers, gradually inching forwards while the 3 operating lifts came and went. As we went up it dawned on me that there might be a delay at passport control.. In fact there were delays before we even got there. The immigration hall was so full that we had to form three separate queues along a corridor just to get into the main queue. When I finally got into the immigration hall, it was pandemonium. The capacity in this area is clearly far too small and there are far too few people checking passports. The system just can’t cope with the traffic being sent through it. It’s a basic management problem that apparently nobody is prepared to do anything about. Improving it would cost money, of course, but why bother? Passengers are hardly going to turn around and go home at that point, so who cares? 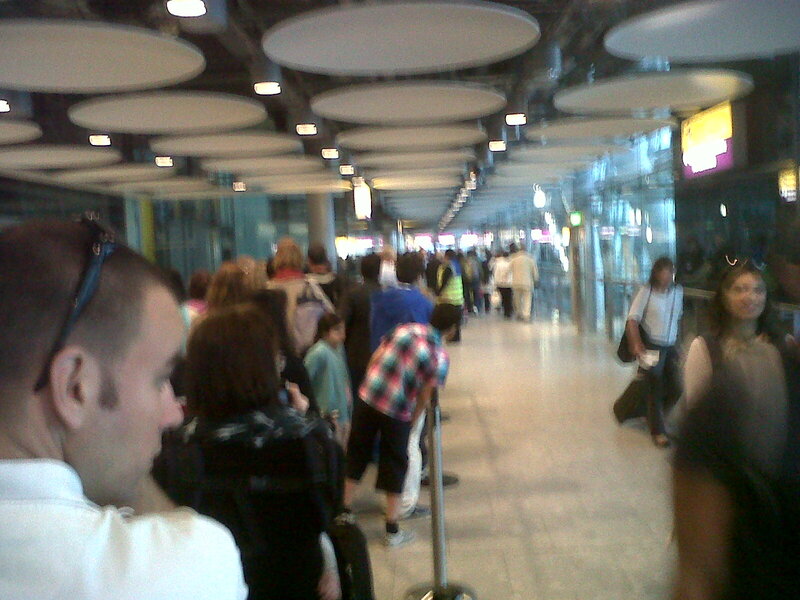 At least the queue for UK/EU passport holders was moving. As I inched forward through the rat’s maze towards a desk I looked from time to time at the “Other passports” line, which barely budged. I felt a sense of anger mixed with shame. What sort of message does this send to visitors to our shores? What kind of country is it that makes showy new buildings like Terminal 5 and then runs them like Fawlty Towers? They don’t allow photography in the passport control area, by the way. The ban is no doubt an attempt to conceal the evidence of what a shambles it is. Anyway, at least the long delay at Immigration meant that my bag had arrived at the Baggage Reclaim by the time I got through. I picked it up and made for the Heathrow Express connection to Paddington. The time was just after 8.30; one hour and three quarters after we’d landed. Still at least I was on my way. Or was I? The train departed and then stopped at a signal. We waited. Eventually the driver explained that there was a major points and signal failure so only one line was operating. We got to Paddington, but it took 35 minutes rather than the usual 15. There is an alternative way of getting back to Cardiff from Heathrow, which involves taking a bus to Reading and getting the train from there. Although that route is cheaper, there is a risk of severe traffic delays at rush-hour periods, so opted for the Heathrow Express in the belief it was more reliable. More fool me. 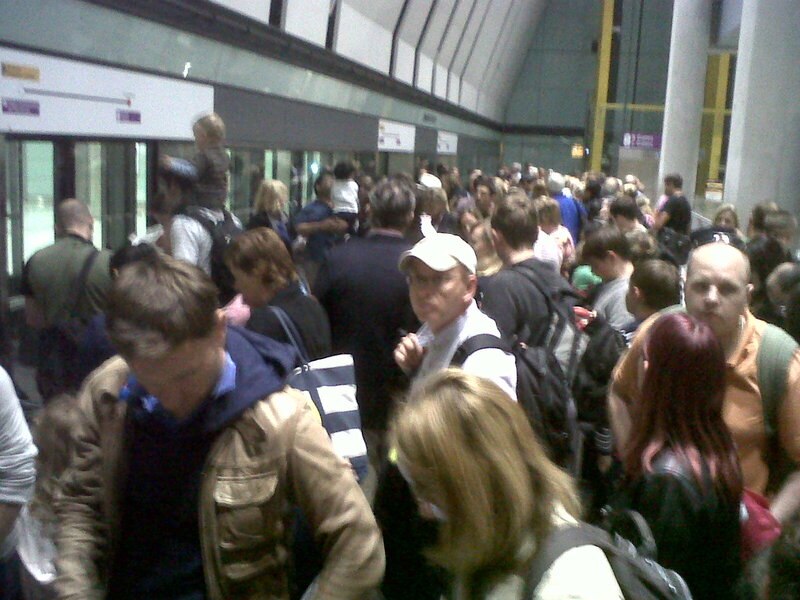 When I arrived at Paddington, it too was a mass of disgruntled people. The reason? No trains. The same signalling problem was disrupting trains into and out of Paddington. 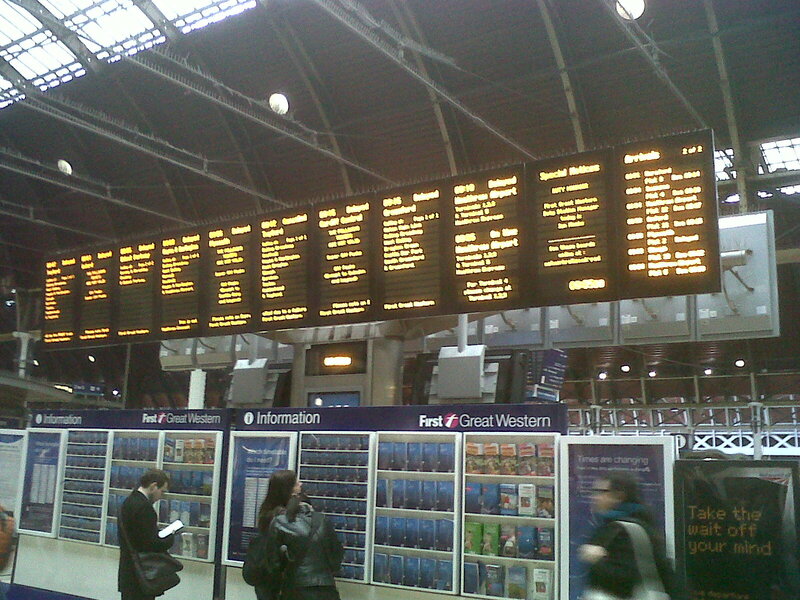 All departing trains were simply marked as “delayed” on the boards. Eventually, I got the 9.15, which departed at 9.38. Not too bad in the end. Except that it had to navigate a crowded route westwards. We arrived at Reading after 50 minutes instead of the usual 25. Then things seem to settle down. We started to move at full speed. I even had a short nap. I was woken by an announcement from the guard. It had been decided that the train I was on would not, after all, be going to Cardiff but would terminate at Newport. First Great Western like to make the most of any possible inconvenience. It’s only 15 minutes from Newport to Cardiff, but it was too much trouble to take us that short distance. We were turfed off and had to wait for local commuter train. Not surprisingly, it was packed so I had to stand all the way. I’ll be expecting a refund from First Great Western, but that’s not the point. It’s their contemptuous attitude to the travelling public that’s the point. Their prices are so high one might expect them to treat passengers with some respect. But no. Anyway, I got home exhausted, stressed and frustrated. Given how badly things had gone I half-expected my house to have fallen down while I was away, but thankfully all was well back at the ranch. I decided to cool off a bit before writing this account of the journey, otherwise it would have been even more intemperate! I had been planning to go into work this afternoon but was in no fit state. Still, it’s good to be home. Kind of. Well, I’m finally back on line. After reporting the fault with my broadband connection on Saturday morning, the technical team quickly diagnosed a fault at my end and mobilised an engineer. Unfortunately the earliest appointment was this morning, between 8 and 12, so I had to hastily rearrange some appointments in order to take the morning off. Actually the chap came quite early (just after 9) and quickly figured out the broadband modem wasn’t working properly, so he gave me a new one, complete with wireless hub. Great, I thought. All operational parameters looked good, so he proceded to try activate it to connect with the Virgin Media network. What could possibly go wrong? Actually, quite a lot. After numerous reboots of both computer and modem, the darned thing still wouldn’t connect to the outside world. Then the engineer called back to base and was informed that there was a fault at system HQ which meant no new services were being activated. The engineer then left – at about 11am -for another job, telling me just to wait and it would get activated in due course. To be fair, he did phone back later to check whether it was working. It wasn’t. Rather irritated at the impasse I decided to remain in the house and get as much work done as I could without an internet connection whilst checking back every now and again to see if it was working. The little green lights never flickered, though, and the activation wizard stubbornly refused to venture further than the first screen of instructions. Eventually, about 4.30pm, the connection appeared to be emerging from its comatose state. I followed the activation instructions, and for a change actually got to the second screen. But it crashed again. I rebooted the modem yet again. No joy. Then tried restarting the computer and – lo and behold! – it started working. Must have auto-configured itself better than I could configure it. No surprise there, I’m not very good with computers really. I’m too old. So now I’m back on line, annoyed at having wasted a day but in the end pleased that I do now actually have something like proper broadband speed. Before it failed completely on Saturday, I’ve been struggling along at <50 kB/s for a few weeks now. “Virgin Media – the Broadband that’s slower than Dial-up” is not their official slogan, but I assumed my slow connection wasn’t unusual given the horror stories I’ve heard. Anyway, I’m now actually getting – though only occasionally – the 10 MB/s I’ve been paying for. All’s well that ends well, suppose. and it’s nice to be back online. Even the e-astronomer has managed a post while I’ve been off! Coincidentally, the first thing I read on Twitter after reconnecting was the story of the First Great Western train that got stuck between Newport and Cardiff because about 60 cows surrounded it and appeared to be holding it hostage. I thought this breaking moos was quite amusing, but hope the passengers aren’t too cowed by their experience. Even in cattle-class. They’ll have plenty to beef about when they eventually get home, that’s for sure….cont, p. 94.